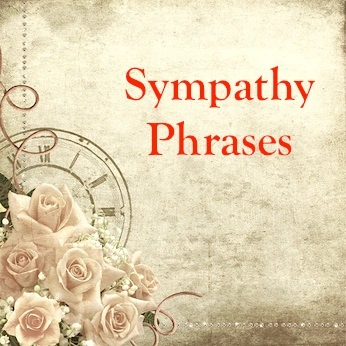 Use these sympathy and condolence phrases for your sympathy notes and cards. • You are in our hearts and prayers during this sad and trying time. • Words can never express how saddened we were to hear about your loss. • I am truly sorry to hear about your pain and loss. • We just wanted you to know our thoughts are with you during the difficult days ahead. • Although no one can truly understand your sense of loss, I wanted you to know that our hearts are aching for you. • Know that our love and thoughts are with you and not a day goes by that we do not think about you. • All of us whose lives he touched are saddened by his loss. • We will always remember him with love. • He was a truly wonderful human being in a world that has too few of them. • I was deeply saddened to hear about the loss of your father. I know how much he meant to you. • Knowing how painful it is to have lost our dear friend, we can only imagine your pain at losing your husband. • He was a remarkable man who touched all of our lives. • She was a fine woman and brightened all our lives with her smile. We shall all miss her. • I will always hold in my heart wonderful memories of you mother. • I don’t think she ever knew how many lives she touched with her kind words and lovely smile. She will be forever missed. • I feel privileged to have known her for a little while and am saddened by your loss. • Although I never had the pleasure of meeting your wife I feel as though I knew her through your love for her and am saddened by your loss. • I was terribly sorry to hear about the loss of your brother. I know how much you will miss him. • I was saddened to hear about the loss of your sister and best friend. • We just wanted you to know that we are thinking or you and entire family and that our prayers are with you. • I am truly sorry about the loss of your little one. I know how much joy and love he brought into your life. • We will always cherish the memories of his loving smile and generous nature. • We are deeply saddened by this terrible loss you have suffered. • Our hearts go out to you and your entire family. • We cannot even begin to imagine your sense of loss, but wanted you to know that you are in our minds and hearts. • I am truly saddened to hear about the loss of your wonderful long time companion. • She was a wonderful four legged human who easily wound her way into all our hearts. • He epitomized the phrase “man’s best friend” and I can only imagine how much you will miss him. • I know you gave him as much unconditional love as he gave to you and I am sorry for your loss. • I am sorry about the loss of your beloved cat, I know how much she meant to you. If you need information on helping a friend or loved one who is grieving, there is some great information on this helpguide.org site.